Last fall I had a Punches class which seems to be one of everyone's favorite classes. Here is one of the cards that we made. I cased it from a very talented person on SplitCoastStampers - my favorite place for inspiration! Her dress is made using the Artisan Label punch in two colors. The bodice is punched using the Small Oval punch to give her a waistline. Her hat is made using the Extra Large Oval and the Small Oval which were run through the Big Shot using an embossing folder. Her arms are made using the Word Window punch and her hair is the Scallop Oval punch. 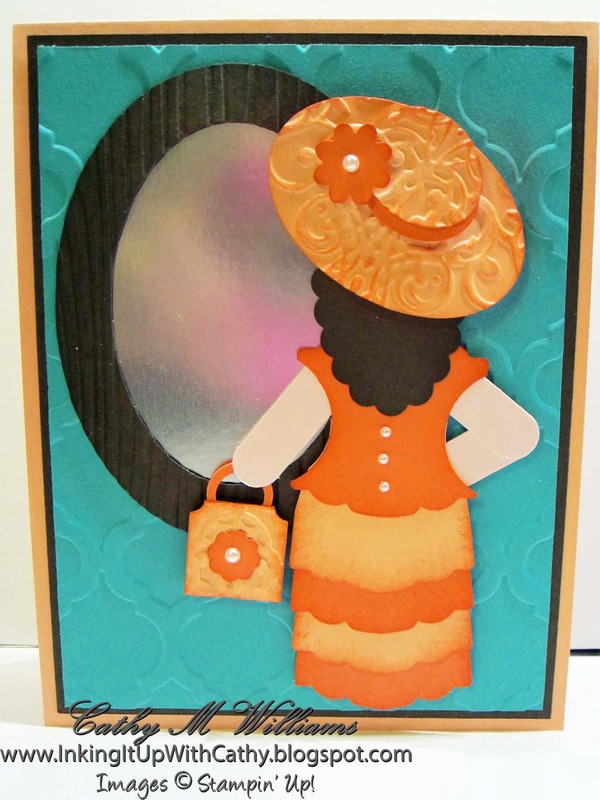 Her purse is made using the Ticket Duo Builder, Itty Bitty Shapes and 1/2" & 3/4" Circle punches. The mirror is made using the Ovals Collection framelits with the frame embossed using the Woodgrain folder.